The Real Deal New York’s February issue is live! Science fiction has long warned about the prospect of robots taking over human occupations. Increasingly, it’s a topic that’s presented more as fact than fiction. But for a traditionally slow-to-adapt industry like real estate, has the time come? 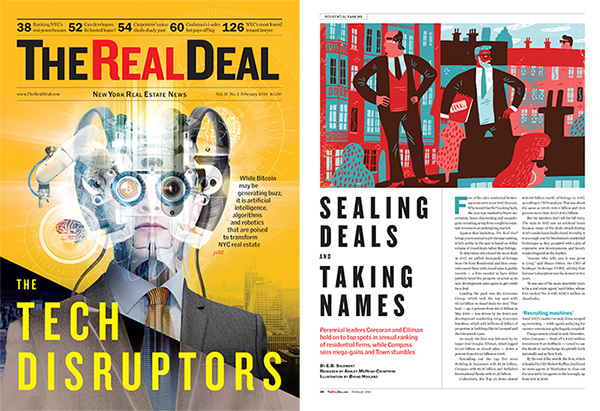 For the cover story this month, TRD explored technologies that are changing the industry now and those that will likely do so in the not-so-distant future. These include smart buildings fully controlled by technology, robots turned construction workers and 3D-printed New York City skyscrapers. Meanwhile, we compiled two comprehensive NYC brokerages rankings: one for the residential world, and another for investment sales. In terms of NYC residential brokerages with the greatest dollar volume of for-sale properties on the market, Douglas Elliman clocked in at No. 1 with 1,187 listings valued at $5.31 billion, up 2 percent from $5.2 billion in May 2016. In investment sales, Cushman & Wakefield rallied to beat out CBRE and Eastdil Secured amid a sluggish market. The issue also took a look at the expected wave of condo loan modifications, as debt issued post-recession nears maturity. There are also profiles on one of the city’s most influential construction unions and on one of the most active hotel buyers.